The Canadian leader in podcast advertising. The Podcast Exchange identifies uniquely Canadian advertising opportunities by targeting the Canadian segment of the global podcast audience. As the Canadian leader in podcast advertising, TPX provides insight and practical knowledge about how to access, leverage and monetize Canadian podcast consumers. We partner with advertisers and publishers to match the content Canadians are listening to with advertising and branding opportunities that have resonance to specific Canadian demographics. Podcast advertising is a great way to connect with an affluent, socially engaged, and brand-loyal audience. TPX partners with agencies to provide targeted access to the more than 7 million monthly Canadian listeners who have made podcasting one of the fastest growing channels in the country. For us, it’s all about great content. Our proprietary agreements with leading publishers and distributors ensure agencies and advertisers have access to the best programming the medium has to offer. Premier programming means an affluent following of engaged and loyal consumers. We provide agencies with advanced geo-targeting and market segmentation, ensuring strategically tailored campaigns that maximize ROI. Proprietary data, and in-house strategic expertise, enable us to craft campaigns with demographic precision. Partnering with TPX means access to the most in-depth research available in Canada. Our annual survey is the go-to resource for publishers, broadcasters and advertisers looking to truly understand the Canadian podcast audience. For the first time, major advertising agencies and media companies joined forces to exchange insights and questions about the emerging Canadian podcast industry. The group gathered on March 21st to help shape the third annual Canadian Podcast Listener survey, which is going into the field in May. TPX is the collaborative creation of industry leaders in Canadian broadcasting, digital media and advertising sales. Each of the company’s principals has a proven track record and established reputation as a leader in their respective areas of expertise. At TPX, we understand that even the best technology, research and data are only good as the team in place to analyze, activate and monetize them. Partnering with TPX means experienced expert counsel to better understand and engage with Canada’s burgeoning podcast audience. An established thought-leader in the industry, Jean-Marie provides insight and passion to companies searching for a way forward in a constantly evolving marketplace. Jean-Marie's work includes partnerships with a broad array of enterprises with a particular emphasis in the media sector. Jeff is co-publisher of The Canadian Podcast Listener report. He’s also the owner of Ulster Media, an independent podcast consulting and production company. From 2011-2017, Jeff was the Director of Digital Talk Content for the Canadian Broadcasting Corporation (CBC). An industry vet, Bob has held senior roles at networks, client side and agency side over his career. Most recently he sat at the genesis of creating award-winning solutions for advertising partners around CBC properties like Radio One Podcasts (with Jeff Ulster), CBC News and CBC Music. 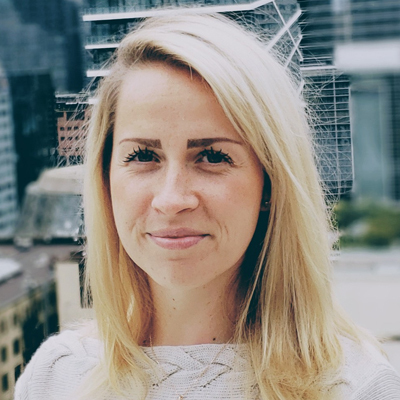 For more than a decade, Erin has been crafting next-level customer experiences in content marketing with Canada’s leading brands. She has been at the forefront of many of the country’s leading content creation companies, working with premier assets in television, radio and digital media.